A permeable driveway and clear cedar trash enclosure are complemented by low-growing plantings. 2. Tie In With Your Home’s ArchitectureWhen adding a structure to the landscape, it’s best to reference the home’s architecture by pulling in the style, paint color, rooflines and materials. If it’s done thoughtfully, something that could be an eyesore — say, garbage bin storage in the center of a front yard — can become an attractive asset to the overall look of the home. At this duplex in Portland, Oregon, for example, the cedar used for the bin enclosure pulls the warmth of the wood down from the siding around the home’s entrance. Given the size and shape of the bin enclosure, it almost reads as if the wood siding was cut out of the front door section and transplanted to the ground-level bin storage. Stairs to entry bypass garage/lower level. This garbage enclosure matches house and is smaller in size. 1 of 2 When adding a structure to the landscape, it’s best to reference the home’s architecture by pulling in the style, paint color, rooflines and materials. If it’s done thoughtfully, something that could be an eyesore — say, garbage bin storage in the center of a front yard — can become an attractive asset to the overall look of the home. 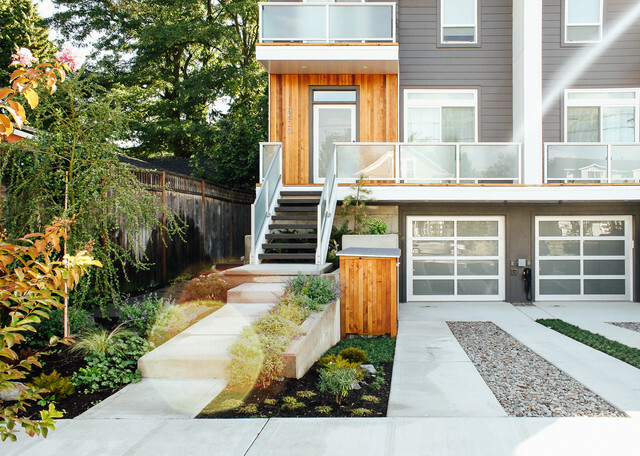 At this duplex in Portland, Oregon, for example, the cedar used for the bin enclosure pulls the warmth of the wood down from the siding around the home’s entrance. Given the size and shape of the bin enclosure, it almost reads as if the wood siding was cut out of the front door section and transplanted to the ground-level bin storage.